Miss Pettigrew Lives for a Day is endeared to me for many reasons but most particularly for validating my eternal credo that self-determination, a good facial and a bottle of Veuve-Cliquot is all anyone needs to change the hand of fate. 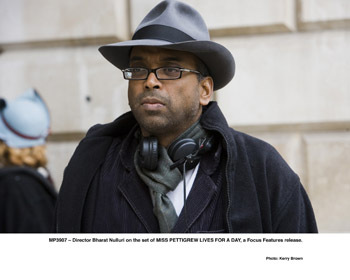 Based on a 1938 novel by Winifred Watson, Miss Pettigrew Lives for a Day is a throwback to the frothy confections of the Ernst Lubitsch /Preston Sturges comedies of the 1930’s, with a dash of Frank Capra morality thrown in of good measure. In 1939 London, Guinevere Pettigrew, a free-thinking middle-aged nanny, has just lost another job minding children and has no prospects left (- she’s dismissed as “the governess of last resort” by her employment agency). 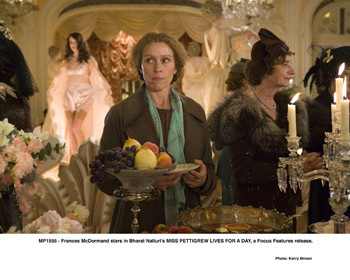 Her worldly belongings in one small case, Guinevere has her dinner through the auspices of the local soup kitchen (- or attempts to – this is a running joke in the film) when she spies some rich folk slumming nearby. Her longing gaze at the have’s (- and her own rumbling stomach) embolden her to do something daring and pilfer a forbidden opportunity to interview for a position with an American actress. Delysia Lafosse is a loosely moralled starlet who lives in the fabulous apartment of one benefactor while entertaining another, all to the betterment of her burgeoning career. Miss Pettigrew’s entry into the Art Deco den of iniquity is nothing that her upbringing as a parson’s daughter has prepared her for. The flighty blonde actress needs all the help she can get with her revolving door of suitors and Miss Pettigrew sees her chance to makes herself invaluable to Delysia. Ditzy, but kind-hearted, Delysia drags her new nan- er… social secretary through the echelons and sophisticated habitués of London society, where she meets Joe, a successful women’s lingerie designer and sought-after bachelor, along with his faithless fiancée, Edythe Dubarry, owner of a top fashion house. In the span of a few hours, Miss Pettigrew is transformed from a luckless, grungy, frizzy haired pauper to a stylish society matron with an odd kind of magic in her forthright advice that seems to always turn out for the best. In her rollicking 24 hours with Delysia, Miss Pettigrew is challenged to look at her life an entirely new way, questioning her own scruples and her ability to enjoy a new life completely unexpected from the one she had in mind. 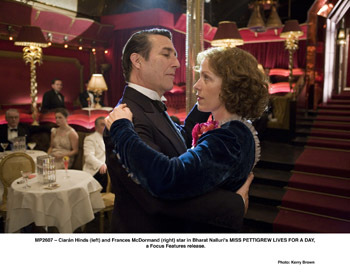 Led by the fabulous Frances McDormand, the cast of Miss Pettigrew Lives for a Day is wonderful. 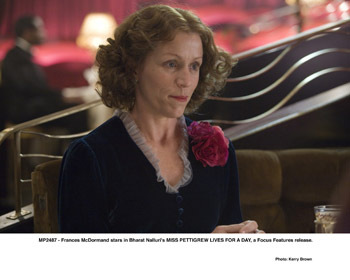 McDormand’s canny instincts never let her go too broad with the wackier moments and her timing is flawless. 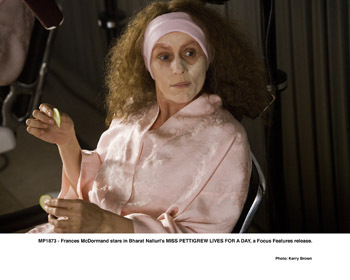 The great big makeover (- called a “fixie”) Guinevere Pettigrew undergoes doesn’t really amount to more than a good facial, hot-oil treatment and new frock, but in McDormand’s hands we see Pettigrew’s internal alterations and her struggle for an even keel. 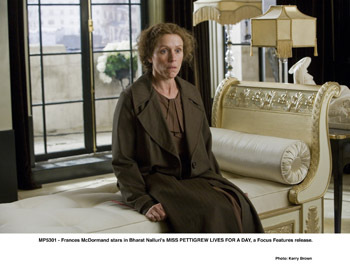 Miss Pettigrew could have easily been some sort of Mary Poppins-esque spinster figure of wish-fulfillment and unerring judgment, but McDormand gives her a centre and a light into her own needs. 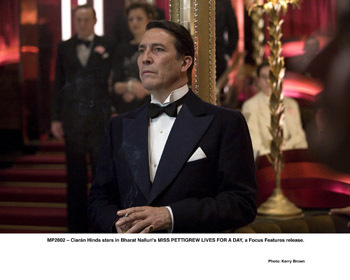 The excellent supporting cast includes the brilliant Shirley Henderson as Miss Pettigrew’s blackmailer, matinee-idol handsome Lee Pace as Michael, a struggling musician and Delysia’s true love, and Ciarán Hinds – who we adore in everything - as the jaded, disillusioned Joe. 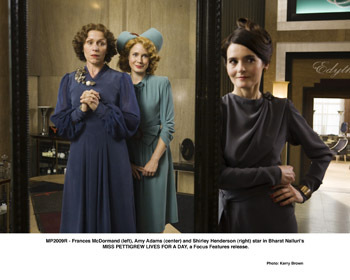 Considering the lure of her co-star, it’s a credit to McDormand’s presence that she manages to keep all eyes on her: Amy Adams, a walking, wiggling, trilling bottle of bubbly on two slender legs plays the bombshell like it was invented yesterday and has a great time chewing the scenery with Delysia’s madcap antics. 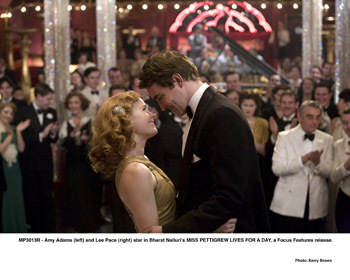 Despite the more eye-grabbing, youthful romance between Adams and Pace, Nalluri strikes a graceful balance and manages to keep the audience as much engrossed in the more mature affections that grow between Joe and Miss Pettigrew. Adams is all the rage since Enchanted became the perfect vehicle for her vivacious charms, but in Miss Pettigrew the constant hyperactive energy of Delysia’s flightiness is a hair away from over the top and just this side of annoying. McDormand’s steady presence pulls her back from that edge time and again and the two styles compliment the characters well. 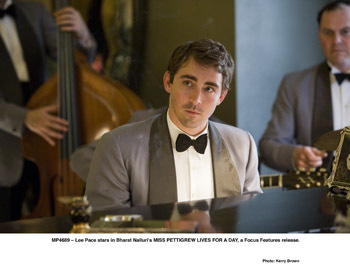 Miss Pettigrew Lives for a Day is a fluffy meringue of a film that’s not going to cure cancer or teach you anything profound, but like its models of the 1930’s and 40’s, is a sweet morality play that’s easy on the eyes. The difference between this film and those of Lubitsch or Sturges, while there are a few screwball laughs and heartfelt attempt to get the brisk comedic pacing of a To Be or Not to Be, Miss Pettigrew lacks the keen sardonic wit that made its predecessors so timeless and engaging. Bharat Nalluri has directed a wonderful looking film, the wonderful camerawork makes all the characters (- except for pre-makeover Pettigrew) look as if they’d been photographed by MGM artiste Laszlo Willinger. 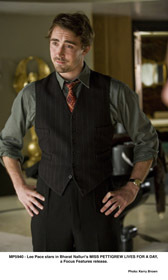 Each scene is saturated in rich colour and the period costumes and jewelry are to die for. Especial care was given to the locations; using the backdrops of London’s Strand and Savoy Hotel and the Rivoli Ballroom and an outrageously gilt, onyx and marble-laden flat completely with life-sized gold Art Deco statues, there is a real feel for the time. Nalluri even sneaks in a romantic Bollywood moment as Delysia and Michael as they croon If I Didn’t Care to each other with a poignancy only found these days in those romantic Indian films. 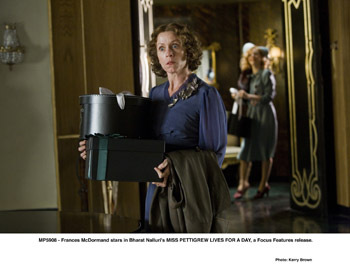 There is an attempt to give Miss Pettigrew some gravitas with a few awkwardly inserted scenes depicting the characters’ worries about the coming war, unconvincing and unnecessary because ultimately Miss Pettigrew Lives for a Day is a charmingly inconsequential, frothy feel-good film and sometimes that’s not such a bad thing. All that is required to enjoy Miss Pettigrew Lives for a Day is to take in the production’s eye-candy and the obvious fun the cast is having.